Simple Karaoke or getting the best from your Midi Synthesizer! KMid is part of Extragear, so it does not necessarily ship on the same date as KDE SC. The latest stable release is 2.4.0, published on August 15th, 2010. 2 What is not yet ready? MIDI and Karaoke files are supported. Playback to external hardware MIDI devices. Allow to use software synths as well, like Timidity++ and QSynth/FluidSynth. Added a pitch (transpose) control. 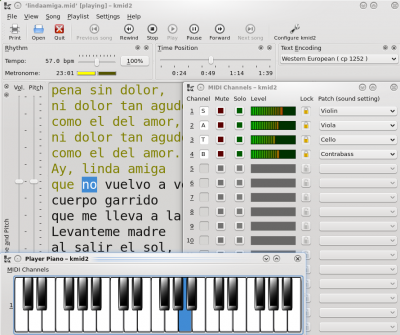 Configurable character encoding, font and color for lyrics. MIDI Mapper, translating General Midi events into other events understood by some synthesizers. Channel window, with solo/muting controls and instrument selectors. Piano player window, using VMPK artwork and technology. Runs in Linux, Windows and Mac OSX. What is not yet ready? Multiple MIDI output ports. Currently plays to a single output port. New kmid_part. This component can be integrated easily in any KDE program, for instance Konqueror can play MIDI files with it. don't set an explicit output pool size, using the default size instead. unconditionally reload MIDI devices before checking the available outputs. Fixed program termination, stopping active notes. Fixed a crash when shuffling an empty playlist. Fixed creation of examples and system songs bookmarks at runtime, for file open dialog places. Bookmarks are created only when files are found. Fixed saving the initial MIDI connection dialog selection. Replaced the initial MIDI connection dialog by a new one enabling online help access, and better design. The last directory used in several open/save dialogs is now saved between sessions. Drumstick libraries v0.3 are needed. External soft-synths can be automatically launched at startup. A new page including FluidSynth and TiMidity++ settings has been added to the "Configure kmid2" dialog. Each channel may be labeled in a text field besides each channel number. New "lock instrument" button in the channels window to override the song's predefined instruments. Settings per song can be saved and automatically retrieved, including text encoding, volume, pitch, rhythm, channel labels and fixed instruments. The sample songs location is added to the places navigation panel in the open dialog. Several other usability enhancements. Many thanks to the KDE Usability Team for the suggestions. Fluidsynth is an alternative. It has a helpful gui called QSynth. For soundfonts, try General User GS. For more information and options, there is a tutorial available. Mandriva and Fedora users: available at the official repositories of your Linux distribution. This page was last modified on 15 September 2010, at 15:25. Content is available under Creative Commons License SA 4.0 unless otherwise noted.